For much of my life, I’ve struggled with the feeling that I don’t belong. Some of my most poignant childhood memories are of being alone: being the new kid alone on the playground, being the teacher’s pet alone at the front of the classroom, being the quiet girl alone with her book in the cafeteria. I decided pretty early on that I didn’t ‘get’ other people and that they didn’t get me, and I wore my loner badge with prickly pride to hide the hurt and confusion beneath. Brief periods of deep connection ended in painful fallings-out, further reinforcing my lone wolf status. Not surprisingly, the isolationist outlook I carried with me into adulthood didn’t serve me well when it came to building personal and professional relationships. Then, on my 26th birthday, I started a blog. The motivation was simple—I wanted a creative outlet—but the outcome has proven nuanced in ways I’m still discovering almost eight years later. For the first six months I posted into a vacuum, all the while bemoaning the fact that only my family was reading me. Then someone other than my mom left a comment. (I still remember who it was!) She thanked me for my recent visit to her blog, told me she’d found me through the link I left to my own. A lightbulb went off. An idea that seems obvious today felt revolutionary at the time. To be a part of the conversation, I had to—gulp—poke my head out of my shell and start conversations. Thus began a flurry of outreach, a veritable snowstorm of commenting. Every night I made my rounds in the growing blogosphere, leaving words of encouragement and support on each post I read. In those early days, blog etiquette dictated that a comment received was a comment returned. As a result, online friendships blossomed and grew. They eventually transplanted themselves offline with blogger meet-ups, conferences, collaborations. We bonded over our shared love of style, our passion for what we were building in this uncharted new territory, and even our self-admitted social anxiety. My emotions ran the gamut from giddy to positively overjoyed. At last, I had found my tribe. My journey since then has meandered. From the heady rush of community during my days as the co-founder of Rue Magazine to the heartbroken period of withdrawal following my divorce, my sense of connectedness with the world has ebbed and flowed. Yet the lesson has remained consistent. The more I put myself out there, the more I receive in return. The feeling of belonging that eluded me for so long rests entirely in my hands; it’s just up to me to practice the behaviors that manifest it. What’s more, through my actions I can foster that feeling in others. For when I let them know that I see and hear them—give them same recognition I myself crave —I let them know that we all belong together. We can all take these steps. We are all truly powerful. This ability (dare I say responsibility?) to create connection is why I do what I do. It’s why I blog even on days when I’d rather throw my laptop out the window. It’s why I’d rather collaborate with others even when it means taking a smaller piece of the financial pie. 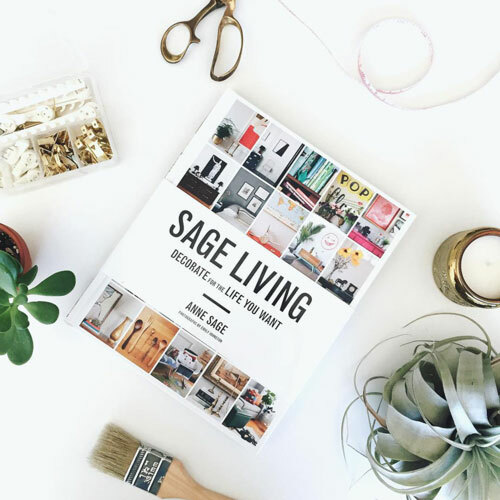 And it’s why my book Sage Living exists in the form that it does, for it inspired me much more to share the stories of twenty-eight real people than to publish a volume consisting only of pretty pictures. I do this work because my sense of groundedness on earth depends on it. I blog for the daily reminder that contrary to how I sometimes feel, I am not alone. That I belong here. And that you do too. 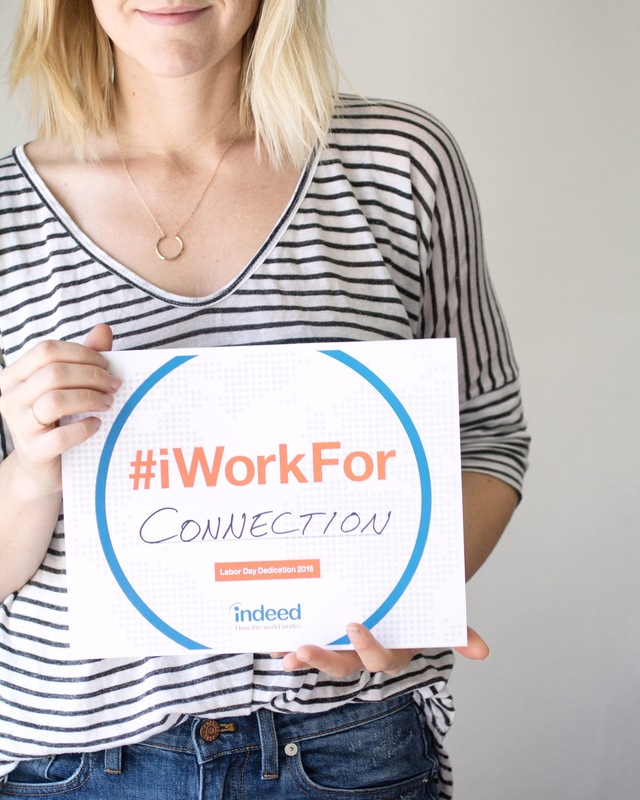 Disclosure: This post is in collaboration with Indeed, the world’s #1 job search site and the perfect partner in discovering what you work for. I received compensation in exchange for writing this piece; however all opinions are my own and I’m grateful for this opportunity to share them! Thank you for supporting the brands that enable me to create connection and earn a sustainable living while doing it. While you and your blog have evolved so much, you have stayed so much the same… in all the best ways. i came here recently when I saw your home tour on Rue, and was immediately smitten with the new layout. I’m so glad you’ve stuck with your blog. It’s such a reflection of you, and I’ve never doubted that for one minute. You can be part of my book-reading birthday party (true story, downfall of my grade school social status), one-woman wolf pack, anytime! 😉 I have always been the same way, and feel lucky to have things like Instagram and my blog to connect with like-minded people I probably never would have met otherwise. Thanks for continuing to put yourself out there and sharing your lovely ideas with the world! Oh, the good ol’ days of blogging! 😉 It’s how I met some of my closest friends, funny enough. Though I quit ages ago. I’m glad you haven’t lost your motivation – I’d be so sad! Thank you for sharing why you blog. Reading this made something click in my mind. What a beautiful message to impart: “I blog for the daily reminder that contrary to how I sometimes feel, I am not alone. That I belong here. And that you do too.” Love! Hope to see more of this! Thank you for writing this post. I was inspired to write my own post about my need to be connected. I have just started blogging and I am still writing anonymously. I’m curious to know if it takes courage for you to write openly about yourself or if it is easy for you. I’m so glad the Zappos/Collectively campaign introduced me to you nearly a year ago. I’ve been enamored and in awe by your journey and am so excited for all that’s in store for you. It’s posts like these, on what feels like the loneliest days like these, that I’m so thankful for blogs. It’s really calming to know someone else, especially someone I relate so much to, has gone through similar feelings. We are in this together and I simply cannot wait to have your book in my hands! This is so nice to hear. After debating for several months, I recently started a blog. I don’t have a clear goal in mind, except for the creative outlet, and this kind of goal-less act is a hard thing for me! I decided to just try it and see where it goes. It’s so encouraging that unexpected good things came to you as a result of putting yourself out there. Thanks for sharing.